I always had a weak spot for this Faller "Reiterstellwerk" model. It's not exactly one of the most authentic towers out there, nor does it fit perfectly at this location, but I couldn't resist when I saw it at a dealer's table at Eurowest yesterday. This tower will be called "Emsingen Ef" for Emsingen Sued, Fahrdienstleiter, i.e. it's located at the south end of the station and the dispatcher for Emsingen works in this building. The levers ("Hebelbank") are in the bridge part of the tower, so this couldn't be a purely mechanical tower. There's not enough space underneath the floor to run the actuator wires. However, it's feasible as an electro-mechanical tower, where the levers electrically actuate signal and switch machines in the basement on the right, which then move signals and throw turnouts. I'll place a small tower ("Emsingen En") on the north side of the station to guard the railroad crossing and operate nearby turnouts and northbound signals. Admittedly, two towers is somewhat overkill for a station the size of Emsingen, but there does need to be at least an attendant shed at the crossing to ensure vehicle traffic is safely off the tracks. 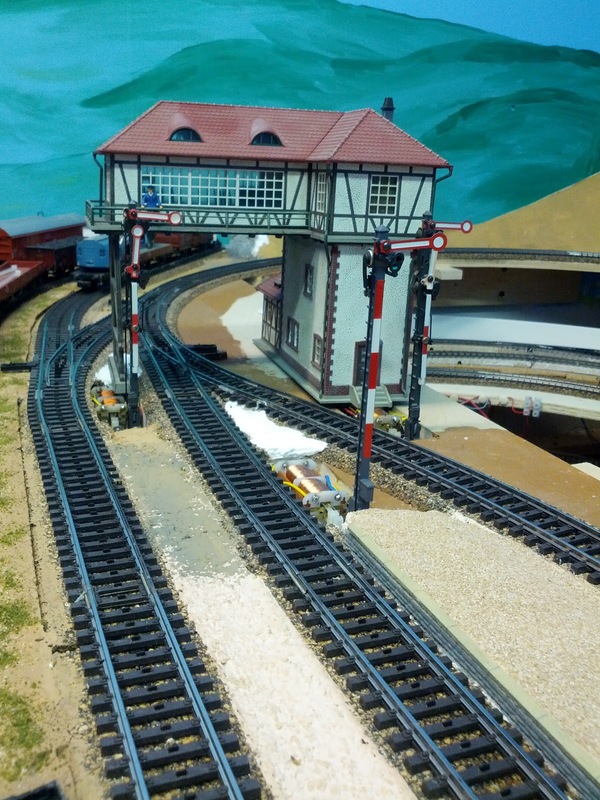 To properly set Emsingen Ef in place, I need to level the ground and cover up the semaphore machines, as well as add some lights at least to the bridge part of the building. I hope illumination will show off the Hebelbank, especially at night. Aside from the tower, I also bought background buildings for Emsingen, and some additional detailing for Emsingen station.